This insurance covers losses incurred when a Japanese company undertaking export, intermediary trade, or providing technical cooperation, such as construction work, is unable to export the goods due to (i) force majeure such as war, revolution, import restriction/prohibition, terrorism, or natural disasters or (ii) bankruptcy of the business counterpart (importer). This insurance also covers losses incurred when the exporter is unable to collect receivables after shipment or after providing technical cooperation, due to the above-mentioned reasons. 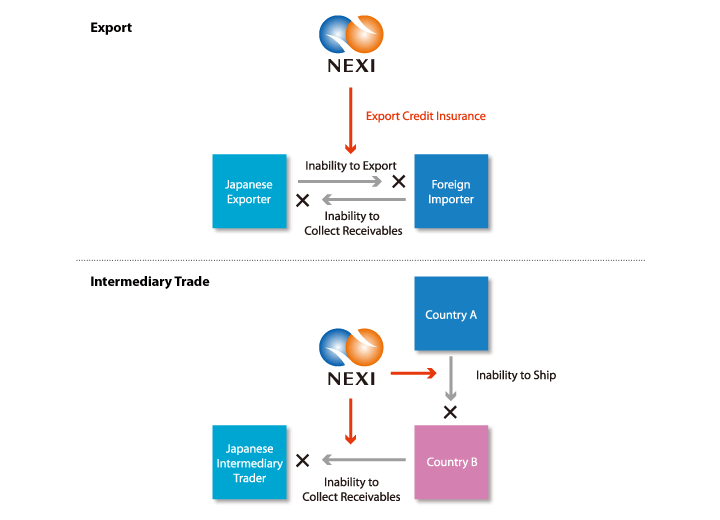 â€»There are different ways of underwriting this insurance such as Export Credit Insurance-Specific Insurance, which underwrites insurance for each export/intermediary trade/technical cooperation transaction and Enterprise Comprehensive Insurance, which inclusively underwrites the entire export/intermediary trade transactions made by a company.